There are times when a ramp is definitely the way to go, rather than building stairs to get into and out of a building. One clear-cut case is for a gardening shed. Who wants to try and carry a lawn mower, or even worse, a lawn tractor, up and down stairs? In such a case, building a ramp is the only way to go. The only question then, is whether to build it out of wood or concrete. I’ve had wood ramps, and they only last so long. A pressure-treated wood ramp will last longer, but even then, it will eventually weaken and break. While you’ll get a lot more years out of a pressure-treated plywood ramp than you will out of just plain construction grade plywood, if you want something permanent, concrete makes a whole lot more sense. Yet many do-it-yourslefers avoid it, because they’ve never done concrete work before. However, working with concrete really isn’t all that hard, other than dealing with the physical weight of the concrete. You’re going to get a workout, mixing, pouring and finishing the concrete. But if you’re reading this, I’m guessing you’re ready for that part. Before setting out to build a ramp, you need to plan out your project. Unlike working with wood, you can’t really make changes mid-project with concrete. You’ve got to decide what it is that you’re going to do and then set up your project to reach that goal. The maximum ratio of length and slope you want on any ramp is one inch of drop for every 12 inches of run. This is a requirement of the American Disabilities Act (ADA), something you have to take into consideration for a wheelchair ramp. But it’s also a practical consideration for other things. If you have a ramp any steeper than that, you’ll find it hard to go up and down, especially when it is wet or icy. Better to run your ramp out a little farther, than to have a dangerous ramp to contend with. The concrete itself should be a minimum of four inches thick, although for light use, you can get by with only two inches. This means that you’ll need to dig out the earth at the ground level, so that bottom edge of the concrete ramp actually goes down into the earth. On the other hand, you really don’t want to be pouring concrete that’s any thicker than 12 inches. If your situation requires that the uphill end of the ramp is more than 12 inches thick, then fill the space in with rock, gravel or compacted dirt, so that you don’t need to use as much concrete. Keep this filler at least four inches away from the edges, so that your ramp doesn’t lose any structural integrity. The easiest way to calculate how much concrete is needed, in cubic feet, is a simple mathematical calculation. To start with, calculate the volume as if you were making a rectangular slab, not a triangular cross-section. To get this volume, multiply length x width x height (or thickens). Be sure that you are doing this all in inches or feet and not a combination thereof. This will actually give you a volume double that of your finished ramp. So simply divide that answer in two, and you will know the volume of your ramp. If you have done your calculation in inches, divide by 1,728 to get cubic feet. To get cubic yards, divide the cubic feet by 27. Concrete comes in 60 and 80 pound bags, depending on where you get it and what type you buy. It should give you a mixed volume on the bag as well. Keep in mind that this is an approximate volume, as how you mix it will affect the final volume. So buy a couple of extra bags, just to be sure. In the case of pouring a ramp over an existing staircase, the volume of the stairs can be subtracted from the total amount of concrete needed. However, other than this, the process is no different, as the ramp cannot be made at the slope of the stairs. It must still maintain the same rise and run as otherwise. You will need a form to pour the concrete into. This basically consists of plywood sides for the form, which are held in place by wood stakes. The form keeps the concrete in place while it is setting, allowing you to do a neat job, rather than something that looks like your kids did it out of mud. Before setting your form, you’re going to have to dig out the downhill end slightly, so as to allow your ramp to go four inches into the ground. The idea here is that the top surface of the ramp will come down exactly to ground level, making a smooth transition for you, for anything that you have to take up and down the ramp. If you try to do this without digging down into the ground, the bottom end of your ramp will break. As you are digging out the ground for the bottom end of your ramp, remove the sod. Don’t just remove the grass, as the roots of the grass will die, leaving a void. You want solid ground under your ramp, not a void. Cut the plywood sides of the ramp to match the exact height you want to end up with. You will be using this as a guide for leveling and smoothing the ramp, so cut it accordingly. Set the plywood form in place and pound wood stakes into the ground to support it. These stakes need to be solid, as the weight of the concrete will try to push the forms outwards. Nail the plywood to the stakes. If you need to, partially fill the space inside the form with a compactable gravel or rock subbase to take up some of the space and reduce the amount of concrete needed. Remember to leave space for four inches of concrete on all sides and the top. Not everyone does it, but it is a good idea to brush oil on the inside surface and edges of your plywood form, so as to prevent the concrete from sticking to it. This will make it easier to remove the form, when the time comes. In the case that you are making an extra-large ramp, such as making a wheelchair ramp from ground level to a raised porch, you will need to pour sidewalls, and then pour the top slab for the walkway. In this case, build a double set of forms, leaving six inches between them. These will become your sidewalls for the ramp and will be poured first. In this case, rebar will need to be used to hold the sidewalls and ramp surface together. Continuous pieces of rebar will need to be bent so that they form a squared off U, then placed with the opening down, so that the legs of the U are in the sidewalls and the bottom of the U is embedded in the surface of the ramp. Once the sidewalls are poured and have a chance to set, the forms can be removed from between the walls and the space between the sidewalls filled with rock, compactable gravel or compacted dirt. The top can then be poured. Before mixing and pouring your concrete, you’ll want to add some remesh (wire mesh) across the entire area of your ramp. Concrete, like rock, is strong under compression, but it is not really strong in tension (pulling), comparatively speaking. That’s why rebar and remesh are used in all concrete projects. Should you end up with a void under your ramp for some reason, then every time you put weight on it, it would be under tension. That could cause cracking in the concrete; but the remesh would strengthen it against breaking. Before pouring the concrete, put in a layer of roofing felt or tar paper on any permanent wood structures that the concrete will come into contact with. This will act as a moisture barrier. For example, if you are building a ramp for a garden shed, you’ll want to put a layer of tar paper on the front of the shed’s structure, where the concrete ramp will meet up with it. For a small ramp, such as you would need for a tool shed or garden shed, you can mix the concrete in five-gallon buckets or a wheelbarrow. 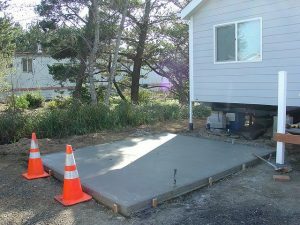 For larger ramps, like a wheelchair ramp, you may want to rent a towable concrete mixer or even have the concrete delivered by truck. The easiest way to buy your concrete for small projects of this type is to use ready-mix concrete. This will already have the proper ratio of sand to concrete mix, saving you having to measure it. All you need to do to mix it is add water. It is possible to add gravel to your ready-mix concrete, as you mix it, to reduce cost. While this lowers the strength of the concrete slightly, it won’t be a problem, as normal ready-mix is stronger than what you need for a garden shed anyway. Mix the concrete, using slightly less water than what is recommended. You don’t want a runny concrete mix for sloped surfaces, such as ramps, so that it won’t have the tendency to try and run downhill. We’re only talking about a little bit of difference in water here, like a drinking glass’ worth, but that’s enough to make a difference. You might want to use a mixing paddle, mounted in a drill to mix your concrete, rather than trying to do it by hand or with a shovel. You can get tired quickly mixing concrete, so anything you can do to make the job easier is worth it. Once you start your pour, you want to finish it. What I mean by that is to continue mixing more concrete and pouring it, until you have enough concrete for the whole ramp. Don’t stop in the middle of your pour for lunch and then come back later. 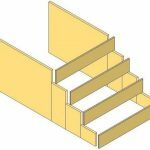 Not only will you create a stress point that could crack in that way, but you may also have a high point that goes above the level of your plywood forms, causing you problems. As you are pouring the concrete in, use a trowel or shovel to puncture the concrete slurry, breaking up any possible air bubbles. For the area near the forms, have someone tap on the plywood with a rubber mallet. This will help bring air bubbles to the surface, rather than allowing them to remain trapped in the concrete, causing voids. When you get the plywood form filled, use a 1”x 4” or 2” x 4” to level the top, allowing it to ride on the edges of the plywood and pushing excess concrete towards the bottom. You’ll need some help for this part, with one of you on either side of the ramp. Slide the bar back and forth, as if you are cutting through the concrete, just above the level of the form. If you find any low points, add more concrete to them, and then go back over them with your wood bar to smooth them out. Once you have your form full and any extra concrete removed, you need to use a hand trowel to smooth the surface even more than what you accomplished with the 1”x 4”. As you do this, you will notice that water or “cream” will rise to the surface. This is good, showing that you have troweled the concrete sufficiently. Allow the concrete to cure to the point where the cream evaporates off, and then broom the surface. This is nothing more than dragging a stiff broom across the surface, to give it a slip-resistant texture. You want this perpendicular to the fall line, so go across the ramp with the broom, not down its length. If you are going to radius the edges of the concrete, it is done at this time, with a special tool, called a steel hand edger. This is not required, but will help prevent you from having a sharp edge to scrape shins on. Besides, it makes your job look more professional. Once your concrete has reached the point where it can no longer run, you can remove the plywood form. This should be roughly one hour after completing the pour. You’re usually better off going a little longer, rather than removing it prematurely, especially if you have oiled your boards. The concrete doesn’t actually dry, it cures by a chemical reaction. It is necessary to keep the concrete wet while it is curing. Continue to wet it down for a few days, after your pour. If you encounter any voids in your ramp, they can be filled with a concrete patch material.